Most climate change adaptation decisions, in semi-arid lands and elsewhere, are made by ‘private actors’ – which include households, producers and businesses. These groups try to manage their exposure to risks and to maximise opportunities when they arise. But they cannot adapt effectively to climate change alone: they require supportive enabling conditions and policies that equip them with the necessary incentives, resources, knowledge and skills. 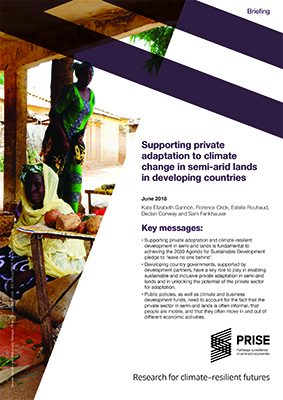 This policy brief highlights the important role for national governments, in collaboration with their development partners, to support adaptation and climate-resilient development among private actors in the semi-arid lands of developing countries. It also highlights opportunities for public adaptation investments and the development of a supportive institutional enabling environment to upscale adaptation and climate-resilient development. Supporting private adaptation and climate-resilient development in semi-arid lands is fundamental to achieving the 2030 Agenda for Sustainable Development pledge to ‘leave no one behind’. Developing country governments, supported by development partners, have a key role to play in enabling sustainable and inclusive private adaptation in semi-arid lands and in unlocking the potential of the private sector for adaptation. Public policies, as well as climate and business development funds, need to account for the fact that the private sector in semi-arid lands is often informal, that people are mobile, and that they often move in and out of different economic activities. This brief is a final output of the Pathways to Resilience in Semi-Arid Economies (PRISE) research project. The brief is the product of a collective effort based on the results of five years of robust, evidence-based and stakeholder-driven research in Senegal, Burkina Faso, Kenya, Tanzania, Ethiopia, Pakistan, Tajikistan and Kyrgyzstan.